For the philosopher, see Socrates. Isocrates (/aɪˈsɒkrəˌtiːz/; Greek: Ἰσοκράτης [isokrátɛ̂ːs]; 436–338 BC), an ancient Greek rhetorician, was one of the ten Attic orators. Among the most influential Greek rhetoricians of his time, Isocrates made many contributions to rhetoric and education through his teaching and written works. Greek rhetoric is commonly traced to Corax of Syracuse, who first formulated a set of rhetorical rules in the fifth century BC. His pupil Tisias was influential in the development of the rhetoric of the courtroom, and by some accounts was the teacher of Isocrates. Within two generations, rhetoric had become an important art, its growth driven by social and political changes such as democracy and courts of law. Isocrates was born to a wealthy family in Athens and received a first-rate education. He was greatly influenced by his sophist teachers, Prodicus and Gorgias, and was also closely acquainted with Socrates. After the Peloponnesian War, his family lost its wealth, and Isocrates was forced to earn a living. His professional career is said to have begun with logography: he was a hired courtroom speechwriter. Athenian citizens did not hire lawyers; legal procedure required self-representation. Instead, they would hire people like Isocrates to write speeches for them. Isocrates had a great talent for this since he lacked confidence in public speaking. His weak voice motivated him to publish pamphlets and although he played no direct part in state affairs, his written speech influenced the public and provided significant insight into major political issues of the day. Around 392 BC he set up his own school of rhetoric (at the time, Athens had no standard curriculum for higher education; sophists were typically itinerant), and proved to be not only an influential teacher, but a shrewd businessman. His fees were unusually high, and he accepted no more than nine pupils at a time. Many of them went on to be philosophers, legislators and historians. As a consequence, he amassed a considerable fortune. According to Pliny the Elder (NH VII.30) he could sell a single oration for twenty talents. According to George Norlin, Isocrates defined rhetoric as outward feeling and inward thought of not merely expression, but reason, feeling, and imagination. Like most who studied rhetoric before and after him, Isocrates believed it was used to persuade ourselves and others, but also used in directing public affairs. Isocrates described rhetoric as "that endowment of our human nature which raises us above mere animality and enables us to live the civilized life." Isocrates unambiguously defined his approach in the treatise Against the Sophists. This polemic was written to explain and advertise the reasoning and educational principles behind his new school. He promoted broad-based education by speaking against two types of teachers: the Eristics, who disputed about theoretical and ethical matters, and the Sophists, who taught political debate techniques. Also, while Isocrates is viewed by many as being a rhetor and practicing rhetoric, he refers to his study as philosophia—which he claims as his own. Against the Sophists is Isocrates' first published work where he gives an account of philosophia. His principal method is to contrast his ways of teaching with Sophistry. While Isocrates does not go against the Sophist method of teaching as a whole, he emphasizes his disagreement with bad Sophistry practices. Isocrates' program of rhetorical education stressed the ability to use language to address practical problems, and he referred to his teachings as more of a philosophy than a school of rhetoric. He emphasized that students needed three things to learn: a natural aptitude which was inborn, knowledge training granted by teachers and textbooks, and applied practices designed by educators. He also stressed civic education, training students to serve the state. Students would practice composing and delivering speeches on various subjects. He considered natural ability and practice to be more important than rules or principles of rhetoric. Rather than delineating static rules, Isocrates stressed "fitness for the occasion," or kairos (the rhetor's ability to adapt to changing circumstances and situations). His school lasted for over fifty years, in many ways establishing the core of liberal arts education as we know it today, including oratory, composition, history, citizenship, culture and morality. Prior to Isocrates, teaching consisted of first-generation Sophists, walking from town to town as itinerants, who taught any individuals interested in political occupations how to be effective in public speaking. Some popular itinerants of the late 5th century BC include Gorgias and Protagoras. Around 392-390 BC, Isocrates founded his academy in Athens at the Lyceum, which was known as the first academy of rhetoric. The foundation of this academy brought students to Athens to study. Prior to this, teachers travelled amongst cities giving lectures to anyone interested. The first students in Isocrates’ school were Athenians. However, after he published the Panegyrius in 380 BC, his reputation spread to many other parts of Greece. Following the founding of Isocrates’ academy, Plato (a rival of Isocrates) founded his own academy as a rival school of philosophy. Isocrates encouraged his students to wander and observe public behavior in the city (Athens) to learn through imitation. His students aimed to learn how to serve the city. Some of his students included Isaeus, Lycurgus, Hypereides, Ephorus, Theopompus, Speusippus, and Timotheus. Many of these students remained under the instruction of Isocrates for three to four years. Timotheus had such a great appreciation for Isocrates that he erected a statue at Eleusis and dedicated it to him. Because of Plato's attacks on the sophists, Isocrates' school — having its roots, if not the entirety of its mission, in rhetoric, the domain of the sophists — came to be viewed as unethical and deceitful. Yet many of Plato's criticisms are hard to substantiate in the actual work of Isocrates; at the end of Phaedrus, Plato even shows Socrates praising Isocrates (though some scholars have taken this to be sarcasm). Isocrates saw the ideal orator as someone who must possess not only rhetorical gifts, but also a wide knowledge of philosophy, science, and the arts. He promoted the Greek ideals of freedom, self-control, and virtue; in this he influenced several Roman rhetoricians, such as Cicero and Quintilian, and influenced the core concepts of liberal arts education. Isocrates' innovations in the art of rhetoric paid closer attention to expression and rhythm than any other Greek writer, though because his sentences were so complex and artistic, he often sacrificed clarity. Of the 60 orations in his name available in Roman times, 21 remained in transmission by the end of the medieval period. The earliest manuscripts dated from the ninth or tenth century, until fourth century copies of Isocrates' first three orations were found in a single codex during a 1990's excavation at Kellis, a site in the Dakhla Oasis of Egypt. We have nine letters in his name, but the authenticity of four of those has been questioned. He is said to have compiled a treatise, the Art of Rhetoric, but there is no known copy. Other surviving works include his autobiographical Antidosis, and educational texts such as Against the Sophists. Isocrates wrote a collection of ten known orations, three of which were directed to the rulers of Salamis on Cyprus. To Nicocles, Isocrates suggests first how the new king might rule best. 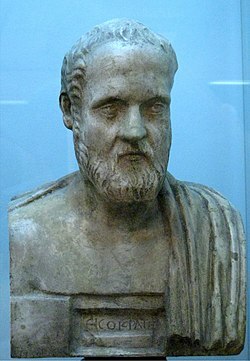 For the extent of the rest of the oration, Isocrates advises Nicocles of ways to improve his nature, such as the use of education and studying the best poets and sages. Isocrates concludes with the notion that, in finding the happy mean, it is better to fall short than to go to excess. His second oration concerning Nicocles was related to the rulers of Salamis on Cyprus; this was written for the king and his subjects. Isocrates again stresses that the surest sign of good understanding is education and the ability to speak well. The king uses this speech to communicate to the people what exactly he expects of them. Isocrates makes a point in stating that courage and cleverness are not always good, but moderation and justice are. The third oration about Cyprus is an encomium to Euagoras who is the father of Nicocles. Isocrates uncritically applauds Euagoras for forcibly taking the throne of Salamis and continuing rule until his assassination in 374 BC. Two years after his completion of the three orations, Isocrates wrote an oration for Archidamus, the prince of Sparta. Isocrates considered the settling of the Thebans colonists in Messene a violation of the Peace of Antalcidas. He was bothered most by the fact that this ordeal would not restore the true Messenians but rather the Helots, in turn making these slaves masters. Isocrates believed justice was most important, which secured the Spartan laws but he did not seem to recognize the rights of the Helots. Ten years later Isocrates wrote a letter to Archidamus, now the king of Sparta, urging him to reconcile the Greeks, stopping their wars with each other so that they could end the insolence of the Persians. At the end of the Social War in 355 BC, 80-year-old Isocrates wrote an oration addressed to the Athenian assembly entitled On the Peace; Aristotle called it On the Confederacy. Isocrates wrote this speech for the reading public, asking that both sides be given an unbiased hearing. Those in favour of peace have never caused misfortune, while those embracing war lurched into many disasters. Isocrates criticized the flatterers who had brought ruin to their public affairs. P. Oxy. 1183, late-1st-century-AD papyrus containing Isocrates's Trapeziticus 44–48. In Panathenaicus, Isocrates argues with a student about the literacy of the Spartans. In section 250, the student claims that the most intelligent of the Spartans admired and owned copies of some of Isocrates' speeches. The implication is that some Spartans had books, were able to read them and were eager to do so. The Spartans, however, needed an interpreter to clear up any misunderstandings of double meanings which might lie concealed beneath the surface of complicated words. This text indicates that some Spartans were not illiterate. This text is important to scholars' understanding of literacy in Sparta because it indicates that Spartans were able to read and that they often put written documents to use in their public affairs. In 2000, a 15-year-old resident alien from Albania living in Michaniona, Greece finished first in his class and became eligible as the standard-bearer of the Greek flag in the upcoming parade for a major national holiday, the Ohi Day. Once news broke that an Albanian was to lead in the parade and carry the Greek flag, massive public outcry ensued throughout Greece and eventually the young Albanian agreed to step down and give his place to a Greek classmate. When the story first began circulating, Greek President Konstantinos Stephanopoulos defended the right of the young Albanian to represent his school by quoting Isocrates: "Greeks are they who partake in Greek education" ("Έλληνες είναι οι μετέχοντες της Ελληνικής πα��δείας"). The insinuation is that ancestry should not factor into the definition of Greek nationality, and that anyone, regardless of the former, should be able to represent Greece and carry its flag, if willing to do so. Tοσοῦτον δ' ἀπολέλοιπεν ἡ πόλις ἡμῶν περὶ τὸ φρονεῖν καὶ λέγειν τοὺς ἄλλους ἀνθρώπους, ὥσθ' οἱ ταύτης μαθηταὶ τῶν ἄλλων διδάσκαλοι γεγόνασι, καὶ τὸ τῶν Ἑλλήνων ὄνομα πεποίηκε μηκέτι τοῦ γένους ἀλλὰ τῆς διανοίας δοκεῖν εἶναι, καὶ μᾶλλον Ἕλληνας καλεῖσθαι τοὺς τῆς παιδεύσεως τῆς ἡμετέρας ἢ τοὺς τῆς κοινῆς φύσεως μετέχοντας. Our city has so far surpassed other men in thought and speech that students of Athens have become the teachers of others, and the city has made the name “Greek” seem to be not that of a people but of a way of thinking; and people are called Greeks because they share in our education (paideusis) rather than in our birth. Extensive analysis shows Isocrates' speech here as restrictive; he is not inviting foreigners to learn Greek. He is warning his fellow Greeks that it is not enough for them to be of Greek blood; they need a proper Greek (that is, Athenian) education as well, lest their culture be overtaken by barbarians. Some claim that Isocrates was merely making an appeal to unite all Hellenes under the hegemony of Athens (whose culture is implied by the words "our common culture") in a crusade against the Persians (rather than their customary fighting amongst themselves). That is, Isocrates was referring to Athenian (not 'greater Greek') culture, and was not extending the appellation "Hellene" to non-Greeks. And yet by these same rules of rhetoric, whether the precedent was narrowly or broadly conceived, it is still precedent. ^ a b c d e Matsen, Patricia, Philip Rollinson and Marion Sousa. Readings from Classical Rhetoric. Southern Illinois: 1990. ^ a b c Norlin, George (1928). Isocrates. London W. Heinemann. pp. ix–xlvii. ^ Livingstone, Niall (2007). "Writing Politics: Isocrates' Rhetoric of Philosophy". Rhetorica: A Journal of the History of Rhetoric. 25 (1): 15–34. ^ a b c d Mitchell, Gordon. "Isocrates". Archived from the original on 18 September 2014. Retrieved 1 October 2013. ^ "Ancient Kellis". Lib.monash.edu.au. 1998-10-02. Archived from the original on 2012-04-20. Retrieved 2012-07-09. ^ a b c Beck, Sanderson. Greece & Rome to 30 BC (Volume 4 ed.). Ethics of Civilization. ^ Terry L. Papillon, The Oratory of Classical Greece: Isocrates II, 2004. ^ a b F. W. Walbank, "The Problem of Greek Nationality" (in: Frank W. Walbank, Selected Papers: Studies in Greek and Roman History and Historiography, Cambridge University Press, 2010, ISBN 978-0-5211-3680-8, p. 5; also in: Thomas Harrison (ed. ), Greeks and Barbarians (Edinburgh Readings on the Ancient World), Edinburgh University Press, 2001, ISBN 978-0-7486-1270-3, pp. 139–140): "It has been widely assumed in the past that the word Hellene began by having a ‘national’ sense and later, especially in Hellenistic times, came to mean ‘possessing Greek culture’. For instance, in Ptolemaic and Roman Egypt the Hellenes were also known as οἱ ἀπὸ τοῦ γυμνασίου, ‘those from the gymnasium’) and frequently had non-Greek names. From Tebtunis we have a list of five Ἑλλήν��ν γεωργ[ῶν], ‘Greek farmers’, of whom only one has a Greek name.’ And it has been thought that the beginning of this extension in the meaning of the word can be traced to the fourth century, when Isocrates wrote,”‘Athens has become the teacher of the other cities, and has made the name of Greek (τὸ τῶν Ἑλλήνων ὄνομα) no longer a mark of race (γένος) but of Intellect (διάνοια), so that it is those who share our upbringing (τῆς παιδεύσεως) rather than our common nature (τῆς κοινῆς φύσεως) who are called Hellenes.’ This passage has attracted great attention, Jaeger going so far as to claim it as ‘a higher ǁ justification for the new national imperialism, in that it identifies what is specifically Greek with what is universally human’. ‘Without the idea which [Isocrates] here expresses for the first time’, he continues, ‘... there would have been no Macedonian Greek world-empire, and the universal culture which we call Hellenistic would never have existed.’ Unfortunately for this claim, it has been shown” that in this passage Isocrates is not extending the term Hellene to non-Greeks, but restricting its application; he is in effect saying, ‘Hellenes are no longer all who share in the γένος and common φύσις of the Greek people, as hitherto, but only those who have gone to school to Athens; henceforth Greece” is equivalent to Athens and her cultural following.’ Thus Isocrates gives the term a cultural value; but he cannot be regarded as initiating a wider concept of Hellas." ^ James I. Porter, Classical Pasts: The Classical Traditions of Greece and Rome, Princeton University Press, 2006, 0691089426, 9780691089423, pp. 383–384: "The telos towards which the whole encomium is directed is neither military nor material, but cultural, and in particular linguistic: •toiio4ia[clarification needed] (in Isocrates’, not in Plato’s sense) is Athens’s gift to the world, and eloquence, which distinguishes men from animals and liberally educated men ... from uncultured ones, is honoured in that city more than in any other. Thus Isocrates can claim that it is above all in the domain of language that Athens has become the school for the rest of the world: “And so far has our city distanced the rest of mankind in thought and in speech that her pupils have become the teachers of the rest of the world; and she has brought it about that the name ‘Hellenes’ suggests no longer a race but an intelligence, and the title ‘Hellenes’ is applied rather to those who share our culture than to those who share a common blood: Like Pericles’ funeral oration in Thucydides, upon which this section of the Panegyricus is closely modelled, Isocrates’ panegyric emphasizes abstract cultural values but its ultimate goal is in fact more concretely military: the speech as a whole aims at convincing the other Greek cities to grant Athens hegemony and leadership in an expedition against the Persians, which will reunite the Greeks by distracting them from their internecine warfare. But Athens’s present military weakness in the wake of the Peace of Antalcidas (387 B.C.E.) deprives Isocrates of the easiest argument, that leadership should be given to the city that has the greatest military strength. Hence he must appeal to past military and culturall glories in order to justify present claims—indeed, his evident reuse of themes from Pericles’ funeral oration is part of the same rhetorical strategy, designed as it is to remind fourth-century pan-Hellenic readers of Athens’s fifth-century glory. But what passes itself off here as the disinterested praise of a city is in fact the canny self-advertisement of a successful businessman, and Isocrates’ climactic celebration of Athenian philosophy and eloquence is little more than a thinly disguised panegyric for what he saw as his very own contribution to Athenian, Greek and world culture. For φιλοσοφία and eloquence were in fact the slogans of Isocrates’ own educational program." ^ a b Takis Poulakos, David J. Depew, Isocrates and Civic Education, University of Texas Press, 2004, 0292702191, 9780292702196, pp. 63–64: "He crafts onto his predecessor’s analogy Athens as a school of Hellas an enduring bond among the Hellenes and a great divide between them and the Persians: Athens’ pupils have become the teachers of the rest of the world” and “the title ‘Hellenes’ is applied rather to those who share our culture than to those who share a common blood” (50). The cultural links Pericles had named as uniting Athenians and their allies lies together are refigured here rhetorically, and in a way that forges a symbolic unification among all the cities of Hellas, including Sparta and its allied states. Relying on and at the same time changing Pericles’ wise words, Isocrates creates the perception of Athens as having been unified with all Greek city-stares from the very beginning, and thereby makes this perception part and parcel of Athens’ glorious history. As a result of this rhetorical engagement of conventional wisdom, current concerns about pan-Hellenism find their way into the city’s timeless traditions. Capitalizing on the propensity of epideictic language to amplify and to augment, lsocrates finesses the stable doxa of the community and enlarges its boundaries so as to accommodate the less stable doxa of the present." Benoit, William L. (1984). "Isocrates on Rhetorical Education". Communication Education: 109–119. Bizzell, Patricia; Herzberg, Bruce, eds. (2001). The rhetorical tradition: Readings from classical times to the present (2nd ed.). Boston: Bedford/St. Martin's. ISBN 978-0-312-14839-3. Bury, J.B. (1913). A History of Greece. Macmillan: London. Eucken, von Christoph (1983). Isokrates: Seine Positionen in der Auseinandersetzung mit den zeitgenössischen Philosophen (in German). Berlin: W. de Gruyter. ISBN 978-3-11-008646-1. Golden, James L.; Berquist, Goodwin F.; Coleman, William E. (2007). The rhetoric of Western thought (9th ed.). Dubuque, IA: Kendall / Hunt. ISBN 978-0-7575-3838-4. Grube, G.M.A. (1965). The Greek and Roman Critics. London: Methuen. Haskins, Ekaterina V. (2004). Logos and power in Isocrates and Aristotle. Columbia, SC: University of South Carolina Press. ISBN 978-1-57003-526-5. Isocrates (1968). Isocrates. Loeb Classical Library. George Norlin, Larue van Hook, trans. Cambridge, MA. : Harvard University Press. ISBN 978-0-674-99231-3. Isocrates (2000). Isocrates I. David Mirhady, Yun Lee Too, trans. Austin, TX: University of Texas Press. ISBN 978-0-292-75237-5. Isocrates (2004). Isocrates II. Terry L. Papillon, trans. Austin, TX: University of Texas Press. ISBN 978-0-292-70245-5. Livingstone, Niall (2001). A commentary on Isocrates' Busiris. Boston: Brill. ISBN 978-90-04-12143-0. Muir, J.R. (2005). Is our history of educational philosophy mostly wrong? : The case of Isocrates. Theory and Research in Education, Vol. 3(2) 165–195. Poulakos, Takis; Depew, David J., eds. (2004). Isocrates and civic education. Austin: Univ. of Texas Press. ISBN 978-0-292-70219-6. Poulakos, Takis (1997). Speaking for the polis: Isocrates' rhetorical education. Columbia, SC: Univ. of South Carolina Press. ISBN 978-1-57003-177-9. Romilly, Jacqueline de (1985). Magic and rhetoric in ancient Greece. Cambridge, MA: Harvard University Press. ISBN 978-0-674-54152-8. Smith, Robert W.; Bryant, Donald C., eds. (1969). Ancient Greek and Roman Rhetoricians: A Biographical Dictionary. Columbia, MO: Artcraft Press. Too, Yun Lee (2008). A commentary on Isocrates' Antidosis. Oxford: Oxford University Press. ISBN 978-0-19-923807-1. Too, Yun Lee (1995). The rhetoric of identity in Isocrates: text, power, pedagogy. Cambridge: Cambridge Univ. Press. ISBN 978-0-521-47406-1. Usener, Sylvia (1994). Isokrates, Platon und ihr Publikum: Hörer und Leser von Literatur im 4. Jahrhundert v. Chr (in German). Tübingen: Narr. ISBN 978-3-8233-4278-6. Wikimedia Commons has media related to Isocrates. "Isocrates" . Encyclopædia Britannica. 14 (11th ed.). 1911.